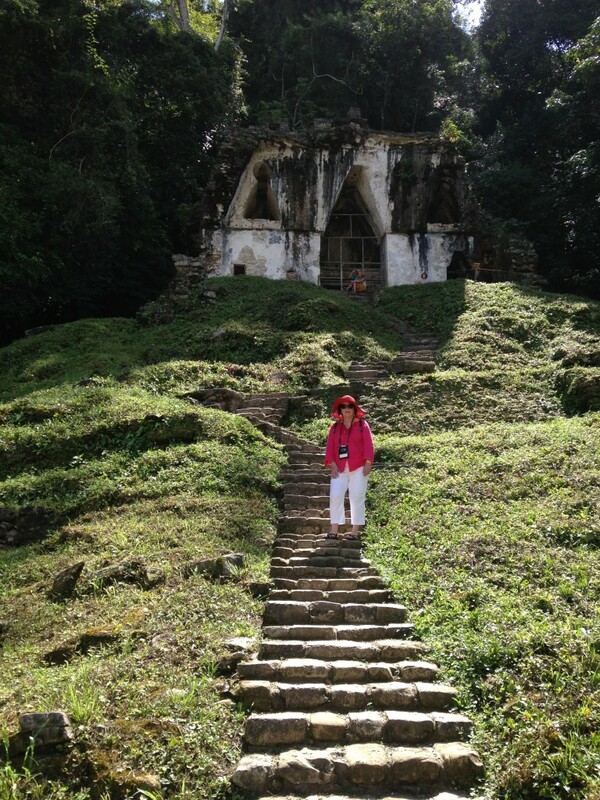 The past splendor of Palenque seems hidden away in a mountainous location of peace in Chiapis Province, Mexico. The site is another kind of beauty altogether compared to many of the archeological sites we’ve seen. 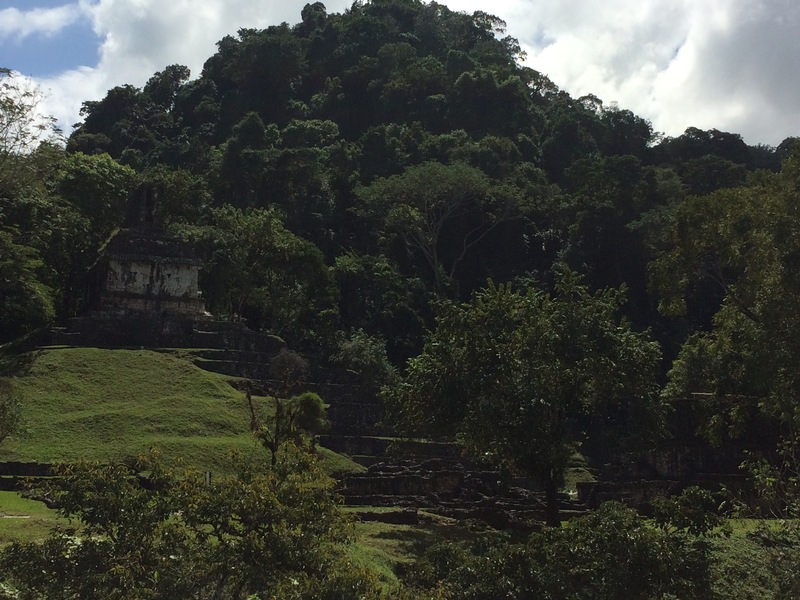 To walk the paths of Palenque today feels as though a magnificent site absorbed by the jungle for centuries is just now peeping out of the cedar, mahogany, and sapodilla trees to see what all these visitors are doing there. It’s estimated that only a small percentage of the buildings have been excavated. Preservation is always a big problem, so often after structures have been uncovered and studied, they are once again buried against thieves and the ravages of rain and sun. The temples are not massive like in Teotihuacan and we all managed to scramble up and down without incident. 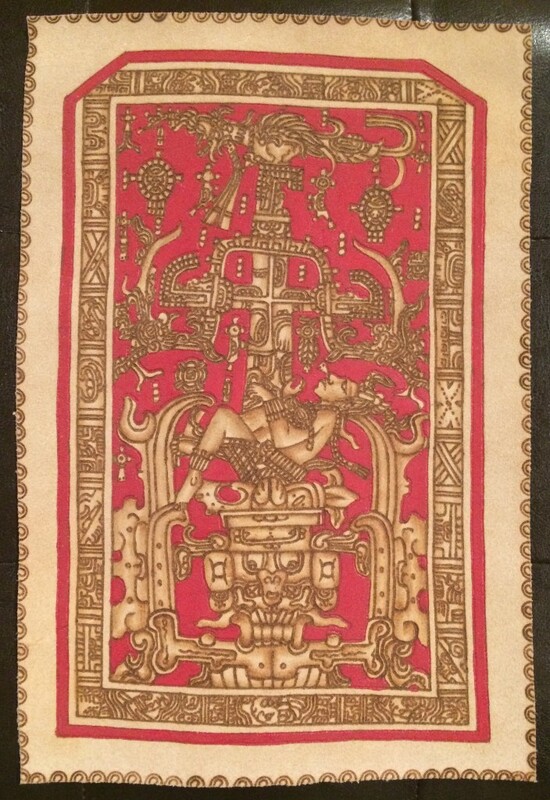 My favorite purchase [below R] was a reproduction on soft leather of the famous sarcophagus lid for King Pacal. It depicts the partially recumbent king either falling into the underworld or rising from it, depending on whether you think he’s entering or escaping from the wide-open jaws of a serpent figure that frames the bottom portion of the picture. If you look carefully, you can detect the upper jaw with its eye on the left, and the lower jaw with its tooth on the right. I particularly enjoyed how the Mayan artisans quietly allowed us to view their work and to take our time in making a selection. 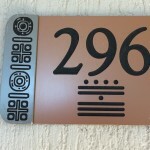 I felt no pressure to buy stuff like I had at Teotihuacan, and consequently I discovered more of their folk arts to admire (and purchase), such as leather boxes of all shapes and sizes. Another artist painted the Quetzal bird on a turkey feather, all framed and ready to hang, truly lovely and unusual. 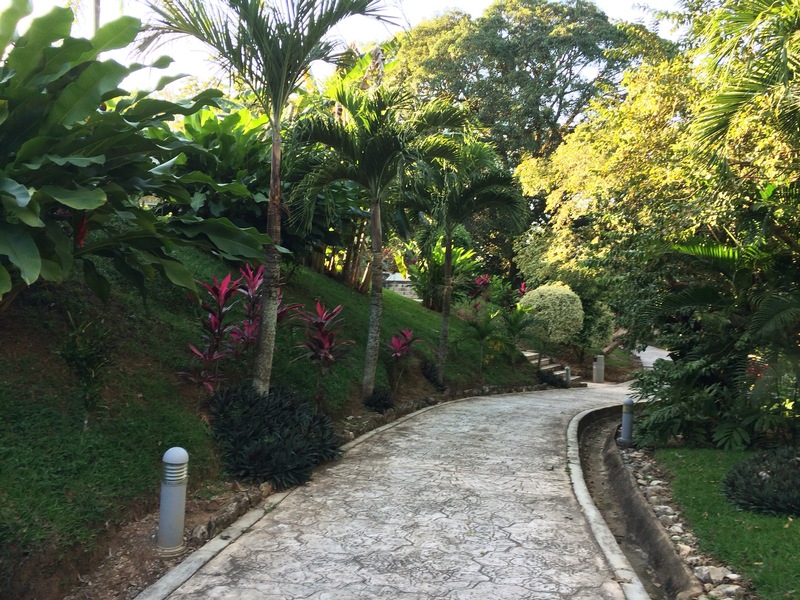 Only five minutes away from the ruins at Palenque, Mexico, the Villa Mercedes Hotel and the ruins are both completely beautiful in their own way. The hotel is a place of gorgeous tropical gardens, azure swimming pools shaded with palm trees, and sprays of water from fountains to cool the air. 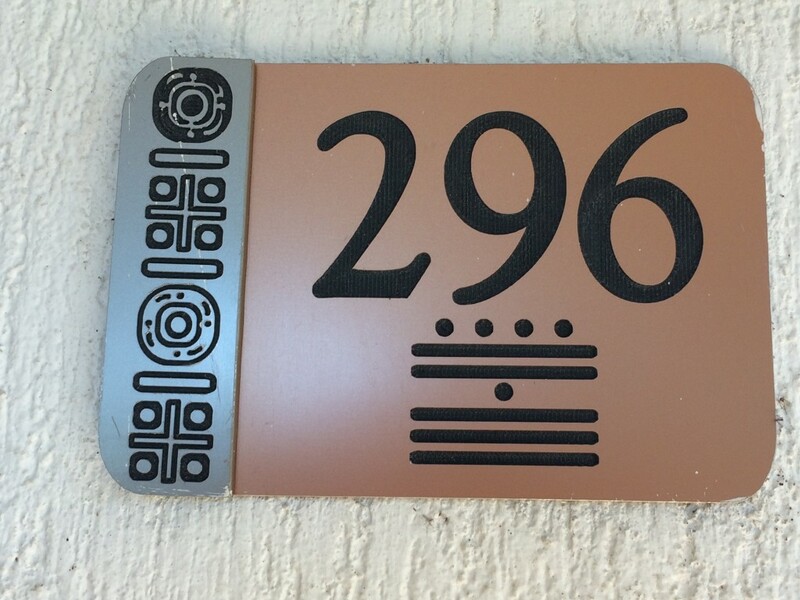 Additionally, I was delighted to see how the traditional Arabic numbers for the rooms were underwritten with the dot and dash equivalent in the Mayan numbering system. In all honesty, your professional life and your personal life are never independent of each other, are they? Evidence of this was seeing my traveling companion who was trained as a social worker, instinctively go into gear when we found a little blonde girl lost and crying under a sign, uncertain whether her family was up the path to the left or to the right. The child spoke fluent English and Spanish, and when we later met her parents in the swimming pool we understood why—her father was from England and her mother was a native Mexican. Then, back to an all-time favorite hotel for a delicious dinner and a delightful evening of conversation with newfound friends. I’d love to come back some day and stay a month, write a book, bask in the calm beauty.